A Remington in GTA San Andreas. 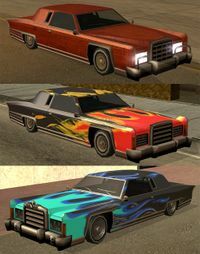 The Remington is a two-door coupe in Grand Theft Auto: San Andreas, occasionally available as a lowrider. The Remington is depicted as a 1970s two-door coupe, modified into a lowrider; accordingly, some Remingtons come equipped with hydraulics. The Remington generally resembles a 1977 or 1978 Lincoln Continental Town Coupe (as identified by the grille and chrome), but with unhidden headlamps, and a baroque stylized rear. Performance wise, the vehicle may be described as average. With a rear wheel drive, very low ground clearance and moderately powerful engine, the Remington has an average-to-good top speed, but is susceptible to tailspins when cornering; it is best suited for urban travel. A flameproof Remington can be found during the mission "High Stakes, Low Rider" for Cesar Vialpando. Being a lowrider, Remingtons may be modified further at Loco Low Co. in Willowfield, Los Santos. The selections of customizations offered for the Remington is wide-ranging, boasting unique paintjobs and unique chrome customizations featuring skull-adorned "Chromer" decors to complement the car's baroque design or geometrical "Slamin" parts for more organized decorations. Remingtons come stock with color matching interior. Unlike other lowriders with wide-ranging customizations, however, the Remington lacks an option at Loco Low Co. to color its interior. Players are thus recommended to change the color of its interior through Pay 'n' Spray until they obtain the desired color, before coloring the car at the mod garage. Several combinations of modifications that can be given to Remingtons from Loco Low Co.. The default radio station in the Remington is Radio Los Santos. The name "Remington" comes from the show Remington Steele, in which the star, Pierce Brosnan, drives a similar car. A red Remington becomes a fixture in CJ's garage in Doherty. It's seen in the missions Deconstruction, Test Drive and Customs Fast Track. Very common in Ganton and surrounding areas. Spawns while driving a Perennial in Santa Maria Beach (and other areas) in Los Santos (Friday). Spawns while driving a Euros in Easter Bay Airport, San Fierro (Thursday). A way of getting the Remington is at the Lowrider Challenge. Usually, all the cars there are locked, and therefore cannot be obtained. The method of getting this car is to shoot the driver in the head through the windscreen. The should cause the body to fall out of the car, thus unlocking the doors and allowing the car to be taken. This can be done with any locked vehicle that has an occupant. Unfortunately though, CJ can be locked out if he leaves the vehicle. This can be an expensive mistake after modifications. Virgo (GTA IV version), a two door coupe similarly drawing inspiration on a late-1970s Lincoln. This page was last modified on 11 October 2012, at 20:58.